Last night I went to hear a talk at Wakefield Historical Society – it was the second time I’d heard Peter Thornborrow talk but last night was more on the buildings who didn’t make it into his book. I took this opportunity to spend a bit of ‘pocket money’ and buy a copy which was signed by Peter and his co-author Paul Gwilliam. Before I tell you about Peter’s book I would like to tell you what Daniel Defoe wrote about Wakefield. A town like London and Bath had a SEASON where people came to do their business dealings and banking at traditional times of the year. Yes, Wakefield at one time was an important part of the West Riding making it worthy of being the Capital of the West Riding of Yorkshire. Wakefield is a clean, large, well-built town, very populous and very rich; here is a very large church, and well filled it is, for here are very few Dissenters; the steeple is a very fine spire, and by far the highest in all this part of the county………..They tell us, there are here more people also than in the City of York. If you slow down from everyday life and look around you – not forgetting to look up, you will see some glorious buildings. Just walk around the Westgate, St John’s and South Parade areas to name a few. St John’s area has one of the finest Georgian squares in Great Britain and The Great Bull in Westgate was one of the biggest coaching inns/hotels in the county at one time capable of stabling about 150 horses and house a great assembly room – so this just goes to show how great and important Wakefield WAS! 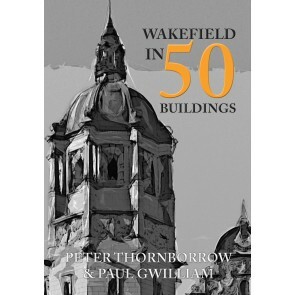 Back to Peter’ and Paul’s book- ‘Wakefield in 50 Buildings‘ is a walk through the history of Wakefield and its surrounding area and takes in buildings both old and new. Each building has a potted history and includes over 100 full-colour images. Although I’ve only had my copy less than 24 hours I have had a chance to, over a cup of tea, read about some of the buildings and take in most of the photographs. The individual does not always get a chance to go inside some of these buildings and see roof spaces and staircases. Peter and Paul have done a great job researching and telling the reader about some of Wakefield’s great buildings. 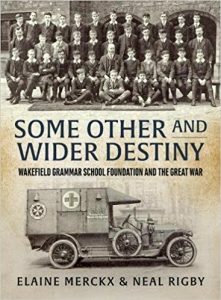 This book will open up Wakefield to those who not only live locally but have or had a family or local history link to Wakefield when it was Great. Wakefield in 50 Buildings is published in 2018 by Amberley Publishing. This entry was posted in News on April 11, 2019 by carol. and being ridiculously organised, I made a list of my father’s belongings and collection I had inherited that could be included and I thought would interesting to the observer. Two items came immediately to mind, quickly followed by his collection of newspapers, reunion photographs, maps etc., The first item was his diary for 1944 and included the lead up to the 6th of June 1944. The second item was his medals. He was very proud to wear his medals but he had one little niggle – he had been on board a ship, waiting to be given the ok to go ashore. I’m not sure where he was waiting to land but he was a bit niggled that he was on the ship for 3 days short to be eligible for the Atlantic Star. Along with his medals were also a collection of ‘badges’ given by the French Government to D-Day Veterans. The Medals, they were in a box and I knew exactly where they were. Starting in my ‘office’ I took books off their shelves with a Normandy connection. Then on to the Medals. But here I hit a brick wall and went into a slight panic. In the box, I thought housed the precious medals was nothing but a collection of regimental ties – Normandy Veteran Association, Normandy Campaign Association, Royal British Legion, Royal Engineers, Royal Artillery and more but no Medals. On the plus side, I did find items that had slipped my memory along with a large number of newspapers and various letters from Her Majesty Queen Elizabeth II and members of her family. It was a pleasure to see even though it was tinged with sadness. After leaving the search for a few days I decided on a systematic search from my ‘office’ downwards. On a row of shelves, at the side of one of my printers, are a number of large shoe boxes containing family history bits and bobs, local history leaflets (they will have to go to be recycled) and CDs. Starting with the nearest box I found what I had misplaced. They were in a box but not the box I remembered them being in. Isn’t it funny how your mind plays tricks with you? I did, however, also find a large number of lapel badges for the NVA, NCA, RBL plus regimental badges and buttons – panic over! With over two months to go all the display material is boxed, well that is apart from a very large frame map of the D-Day beaches, all that I need to do is print a few information labels, then we are ready to go. 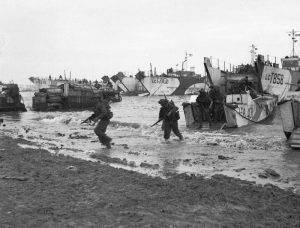 My father was a dispatch rider and expected to be landing on French soil D-Day +5. He actually set foot on the beaches of Normandy D-Day + 1 hour. That is another story and leads onto another story connected to HMS Ark Royal. This entry was posted in News on March 24, 2019 by carol. In 2006, a Thursday outing or war memorial hunt, as my husband called them, ended up in Whitby. Whitby, a traditional North Yorkshire fishing town, now like quite a lot of coastal towns and villages becoming somewhat commercialised, with many of the traditional shops giving way to cafe’s, bars and charity shops. Once famed for its supply of jet that was sourced and worked locally and made famous by the making of Victorian Mourning Jewellery as worn and made highly popular by Queen Victoria wearing of brooches and other items made of Whitby Jet after the death of Prince Albert. Now, Whitby is known worldwide for its connection to Dracula and Goth Weekends. Back to 2006, after walking around the town and having a fish and chip lunch we happened upon St Ninian’s Church – well, I had to go in, didn’t I? As it happens the priest was on site, and after the usual polite conversation, I asked where the war memorial was and could I photograph it. After finding out where the memorial was and answering why I wanted to photograph it, he went on his way and I took the photographs. My partial transcription of St Ninian’s Church and other local war memorials forms part of an exhibition being held at The Brunswick Centre, Brunswick Street, Whitby YO12 8RB on the 16th of June 2018 between 10:00 – 16:00hrs. The exhibition is organised by Whitby Civic Trust will display the war memorials surveyed and researched to date and it is hoped that visitors and relatives of the fallen will be able to help with their research. The research lead by Joyce Stangoe culminates in the display followed by a self-guided walk leaflet and the publication of a book to preserve and share their work. I have given The Trust permission to use information from my St. Ninian’s page in their research, but in the meantime, I thought I might give you a little taster as to what could be available on the day! John and Ann Parkyn (Parkin) during the war that became known as The Great War, saw three of their sons enlist – Arthur, George and Matthew. In 1901 John and Ann were living at Low Hospital Road. John was a cab driver, while Arthur and Matthew were at school, aged 12 and 10 – John George by this time had left home. Ten years earlier in 1891 home was Tynemans (sic) Yard, Whitby. John Parkin worked as an iron miner. His older boys, William J and John G aged 19 and 16 have followed their father into iron mining, while Thomas was aged 9 and attended school. With two-year-old Arthur and eight month old Matthew as the baby of the family. Arthur had been born on January 13th, 1889 and baptised the next month in St Michael’s, Whitby He married Catherine Mary Stephens in 1911 following Banns that were read out on the 10th, 17th and 24th of September. During the war, he enlisted in Whitby and served in the Royal Garrison Artillery, Heavy Battery, as Gunner 31125. He was killed in action on Tuesday 17th of September 1918 and is remembered on the Vis-en-Artois Memorial to the Missing with over 9,800 other casualties with no known grave. It was over the next 12 months that Catherine, Arthur’s widow, was to receive the sums of £12 18s 4d, 11s 6d plus a war gratuity of £15. 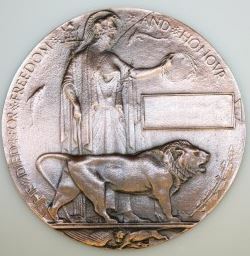 She would also be the one to receive his British and Victory Medals (if they were requested), along with the ‘Death Penny’ Plaque and Scroll. 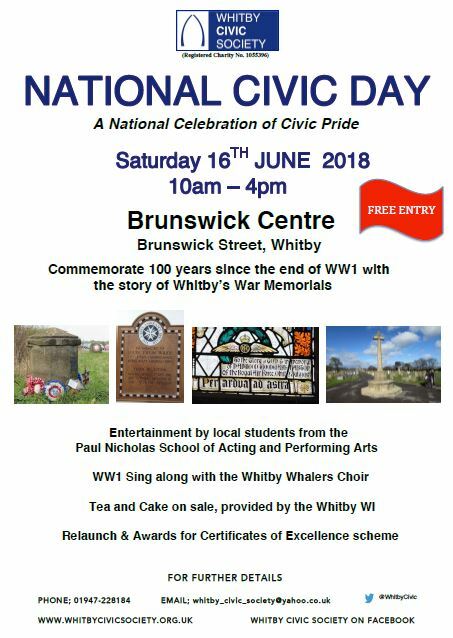 Why not visit The Civic Trust’s exhibition on the 16th of June and see who else from Whitby paid the ultimate sacrifice. This entry was posted in General, News on May 28, 2018 by carol. Following on from my previous blog, I thought I would highlight one of the battle names and find a young man who fought during the Great War. I found a young man named Calais Berry who was born in the late 1890’s in one of the London boroughs. What made this young man interesting was that his WW1 service record has survived the bombings in London during WW2. Calais birth was registered in the Wandsworth District in 1897. 1901 Calais and his family are living at Fords(?) Place, Battersea. He was the son of Abraham Berry, a 51 year old carpenter and joiner who was born in Shropshire. His mother Martha A was aged 41 and born in Cape Town, Cape Colony. Of their eight children, the 6 eldest were born in Chatham, with the two younger ones being born in Battersea. Ten years later Martha A Berry, had included in the second column that she was Mrs Berry, aged 51 she was a widow. Mrs Berry had included that she had been married 33 years and born 10 children – all of which had survived. Four of her children were still at home, ranging in ages from 21 down to Calais’ (now 13) younger sister who was 11. Home for the family was a 3 roomed house – 7 Fords Place – could this be the same house she shared with her husband and her other children? Martha signed the census form Martha Agens Berry. Calais Hugh Berry attested before Capt., H R Hadow in Battersea on the 18th of August 1915. He was a mill assistant living at 8 Alfred Place, Battersea, London. His age was listed at 9 years and 271 days. His height was given as 5′ 6” tall and he weighed 115lbs. Distinctive marks – he had a raised mole on the back of his neck. Calais served as Gunner 166591 in the Royal Garrison Artillery. On the 18th of August 1915, he was attached to the Howitzer Bde. By July of the following year he had been posted to Ripon, while another document has him being ‘Home’ from August 18th, 1915 – 5th March 1916. In France from 6th March 1916 – 8th June 1916 and ‘Home’ from the 19th of June. A rubber stamp across his records tells he was part of the British Expeditionary Force in France 1916. On 23rd June 1916, Calais’ time in the military takes a little bit of a turn! One record tells on 23trd June 1916 he is in No 6 Canadian General Hospital, Rouen. He is sent back to England onboard HS Aberdonian. A letter from the Metropolitan Hospital, Military section, Endfield Road request Calais medical records. He is suffering from vertigo, the records are requested for his discharge when fit. Calais is now serving as Gnr 41261, RFA, HQ Bgde, A Bty. On 19th of July 1916, the War Office received a letter from Mrs A Berry, Calais mother. “ Dear Sir, Having already written to you on behalf of my son, Gunner C Berry No 41261, A Sub, 51st reserve Bty, ****brige Camp, Hemel Hempstead, Herts. I am writing to you once again as I want to prevent him returning on Active Service until he is of age. He has only returned to England a month ago, suffering from Shell shock, and Vertigo, He is my only support. I am very anxious about him for I know he is not fit for returning yet. I have no ********* for him being in the army, but, I think it only just that he should not go back to France until he is 19 which is at the end of November, especially has he has only just returned. I do trust you will kindly see into the matter for me and oblige, Believe me, Yours Obediently, Mrs A Berry, Trusting you will reply and let me know. One of Calais’ records which detail his postings and movement, tells that on the 30th September 1917 he had been at 62 CCS, classified as ‘Wounded Shell Concussion in the field’ The date of him becoming a casualty was 18th September 1917. Had he been wounded before as by the following day the above letter tells that Mrs Berry had already written to the War Office. Had she received the news very quickly and written two letters on the same day? On the 24th July 1916 another letter from Mrs A Berry was date stamped by the War Record Office and the War Office Accounts, went on to say “Dear Sir, I am writing to you on behalf of my son, Gunner C Berry No. 41261, 186 Brigade, RFA Headquarters Staff. 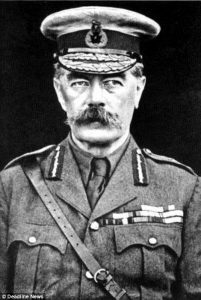 He has been on Active Service, and returned to England a fortnight ago suffering from Trench Fever and Vertigo. He is still very queer, he has suffered when a child with fits and general bad health and I his mother wish to prevent him returning on Active Service until he is 19, which will be at the end of November. I may tell you the Doctor who attended him in France told him not to return until he was nineteen. I am very anxious about him, so I trust you will kindly see into the case for me and let me know, for I sincerely do not want him to return until he of age. Trusting you will do your best, Believe me, Yours Obediently Mrs A Berry. Gunner Berry, RFA was discharged from QAM HP Millbank on 4th July 1916 – could he have been sent to Ripon? In 1917 Calais must have been back in Ripon as in April he was given 3 days CB for ‘having dirty butter on shelf in hut 26’. The following month he was absent without leave from 7th May 1917 to 9 am 9th May 1917 (9 hours). A soldier named O’Keefe was the witness, his charge could have been a repeat of 3 days CB. Calais reported sick on 17th September 1917. On admission at 3 am ‘Unconcious; pulse 66, Temp. normal, Pupils equal, normal- except for slight sluggish reaction to light. Reflex normal, no injury of head detected. Signed off by W J Johnson, Capt RAMC 62 CCS Section 4 ‘I certify that the above named was subjected in the course of his duty to exceptional exposure of the following nature ………….On my way to the Battery position, a shell dropped very close to him. Again on reaching the Battery another Shell dropped quite close. This seemed to him a bit strange in his matter and he rapidly got worse and he was sent to the Field Ambulance. Dated 21/9/1 Signed off by J Harcourt Jeffers Lieut Major 220 Seige Battery RGA., classing Calais as ‘wounded Shell Shock Concussion’. By the 11th of March 1919, Calais was giving his address as 81 Blondel Street, Calvert Road, Battersea. He had joined the army his medical grade was A1. According to his mother’s letters during 1916 she feels is no longer fitting that status. A sheet of his service record informs of his hospital admittances/sick list – On the 23rd of June 1916 to 4th July 1916 Calais was in the Metropolitan Hospital suffering from Vertigo (12 days). The remarks section says ‘No Vertigo observed, Constipated’. On the 5th of March 1918 to 1st April 1918, he was admitted to the Red Cross, Wallasey , again for Vertigo (27 days). The following line tells that he was in The Western General, Fazakerley, Liverpool. The dates don’t appear to be in order as he was admitted on 20th February 1918 and discharged on 5th March 1918 – the same day he was at the Red cross? He was suffering from Heute Nephritis – did he go straight from one to the other? Did Calais go back to France? Did he survive the war? Yes, he did return to France and survive the war. Initially going to France in March 1916, returning by mid-June of the same year. By the 31st May 1917, he was back in France, returning home on 20th February 1918. Serving once again ‘at home’ until 16th April 1919. He was demobilised on that day, being transferred to Class ‘2’ Army Reserve having served 3 years 242 days – most of which had been in England. In the first few months of 1925, Calais married Grace Hobin in the Wandsworth Registration District. In 1927 there is a birth for a child born to Berry/Hobin – Olive A born in Lambeth. Before the war Calais had been working as a mill worker, by the time of the 1939 Register, now supporting his wife, he is District Manager, Scottish Legal Life Assurance Society. He is also a Special Constable Wartime with the Portsmouth City Police. Grace, like many other women, did Household Duties, was part of the Voluntary Aid Detachment. Home for the couple was 8 Wallisdean Avenue, Portsmouth. 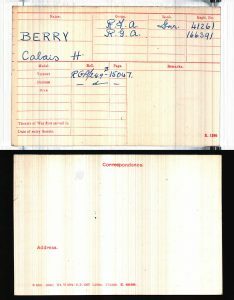 In a 1954 Telephone Directory, Calais H Berry was living at 9 Auburn Road, Redland, Bristol. You could contact Calais by ringing Bristol 3-5426. Born on 20th November 1897, Calais died aged 92 and is registered in the Dec Qtr of 1989 in Bristol. This entry was posted in News on July 22, 2017 by carol. Whilst browsing through a batch of photographs I came across a poster I had saved from the National Archives. The poster was entitled ‘Babies of the First World War’. I would have collected with the thought of using it as a base for a blog…….later. Well, the poster has now found its time to be of us. I blogged about place names and titles being used as first names a while ago, but not until rediscovering the poster had I ever thought of battle names being used as first names. Why not? It is only like the Beckhams of today using Brooklyn as one of their children’s names. The poster informed that over 1,200 babies were named after battles. 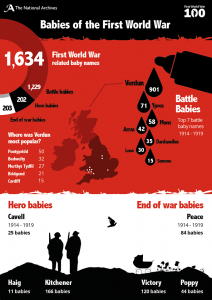 Over 200 babies were named after heroes and 203 babies were named after the end of the war. The name Verdun was used 901 times and was most popular in South Wales. The battles of Ypres, Mons, Arras, Dardanelles, Loos and Somme were responsible for some children’s names. Why? Was the father involved in the battle? Did he lose his life during a battle, or did a relative or close friend lose his life? My great uncle was in the battle of Passchendaele which has its centenary coming up shortly. It appears that in the September quarter of 1918 a baby was born and given the name Paschendale, his family name being Holman. Cambrai also seemed to be used as a first name, this time as early as 1874. Also being used from 1915 to 1933. Dunkirk also seems to have a couple of entries in the first two years of the war. Calais, another French town is not forgotten, with two births in the late 1890’s, eight births in the Great War period and two during the Second World War. Ostend also seems to have had its fair share of naming. In 1920 the Belgian town of Poperinghe is remembered by the Jones family. Vimy Ridge is not forgotten in the naming stakes and is popular, having its first mention in 1916. With the Moore, Chapman, Banister and Isaac families using this first name. During WW2 Arnhem is remembered with three births. Using names of battles or heroes is not a 20th or 21st century idea, as early as 1848 Waterloo was used by the Hatton, Waters and Durrant families to name their children – all boys I presume! Trying earlier battles and wars, and using ‘Civil’ as a search criterion I came up with it as a name being used quite a number of times. The earliest entry in civil registration is Civil Reed born in 1837 with the latest entry being 1930. The name has been feminised in some instances to Civilia. The end of the war was remembered with the use of the name Peace. The name has been used for many years but civil registration has seen one or two children born each year with that name. There are 16 births recorded in the June Qtr of 1856, this coincides with the end of the Crimean War. The numbers fall back to one or two each quarter until the first quarter of 1902 with nine children being given the name, followed by 27 children having Peace as a first or second name – being either male or female. December of 1918 had 28 namings. A steady stream of namings follows in each quarter until the September entries of 1919 when over 45 children have Peace or Peacefull as a first name. The same trend doesn’t follow after the Second World War. Victory has been used as a first name for many years with at least one or two being recorded in Civil Registration since 1937, with a growing number being registered from 1914 to December of 1918 with over 35 instances. The National Archive poster tells that between 1914 – 1919 the first name Cavell is used 25 times. But omits, as I have found with other names, that the first entry in Civil Registration was Cavel Dickinson in 1844. The next entry in 1854 followed by 1901. The name not being registered again until the December quarter of 1915. During in the war years it was used over 25 times. From 1920 being used at least once or twice each year. I know the poster is informative but when looking at the poster I was lead to believe that these names were only used from that time, but with a little bit of time spent on FreeBMD I know know that these names have been used from Civil Registration and if I looked at Parish Registers would find that many of the names would go back further. This entry was posted in News on July 21, 2017 by carol. Extracts from father’s diary of his visit to Germany with Queen Elizabeth Grammar School, Wakefield in the summer of 1931. Shelly Church. About 7.0 o’clock we reached the Tyne Cot Cemetery on Passchendale Ridge. The sun had lost its fierceness and a few small white clouds were high, very high up in the heavens. Nearby a lark deadened the sound of our feet as we walked up the avenues between long white rows of gravestones, prim and even, save where the plain wood cross of a fallen foe broke the white line. 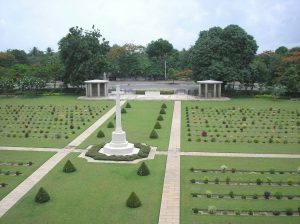 At the head of the cemetery on a semi-circular wall are the names of the fallen, 3500. Many of the gravestones bear names; many have but the inscription “Known unto God”. It was very peaceful amongst the lavender and rambler roses, so peaceful that war seemed very far away indeed; and above us sang the skylark. The signs of war have rapidly effaced. New buildings have sprung up. The fields are now corn, the pastures level but for the occasional hollows which are not quite filled in yet. We were at Ypres before we knew it, and entered by the Menin Gate. Here over 50,000 names are recorded of those who fell before the city. 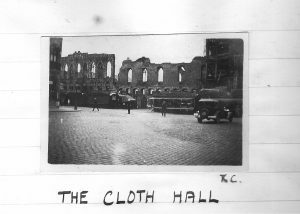 The Cloth Hall is still a blackened ruin; it is to remain a perpetual memorial of war. By it are stall with curios to sell and little children asking for centimes. We bought some curious stone covered apparently with clay and gunpowder, with a very effective crack when dropped. Child also bought a very large cigar; he wondered whether customs would pass it, but they never bothered him. From Ypres we bumped along, passing a curious steam-tram (these run on railway lines where the foot-path should be and are uniquely wonderful) until we came to the trenches near Nieuport. The very extreme north section of the trenches is preserved with blasted trees and stagnant pools complete, the guns still jutting from their emplacements. It was eerie and rather awful in the dusk. That was our last stop…….. This entry was posted in News on July 20, 2017 by carol. Recently I was given a leaflet letting me know of an art exhibition in Gravelines, Northern France. Why was I given this leaflet? Well, it so happens that one of my friends has been asked to exhibit some of his oil paintings…………how good is that? Who is my friend and the artist? David Segrave is his name and he has a background in graphic art. He has family origins in Jersey and lives in the South of England but spends some of his time on the Chateau du Gandspette, where he has a small exhibition in the restaurant. His work is admired by those who either eat in the restaurant or step inside to visit the bar for a coffee or a cooling drink on a hot day. The exhibition opened in June and closes Sunday 27th of August with many local artists, including – Christian Beni, Grande-Synthe; Francois Wetterwald, Dunkirk, exhibiting in one of the 8 display areas. 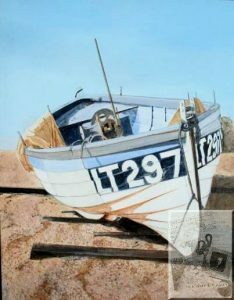 David will be displaying his art in the Corps de Garde Varennes, Place de l’Esplanade on the 26th and 27th of August 2017. The exhibition areas are open from 10:30 to 12:30 and 14:20 – 18:30. 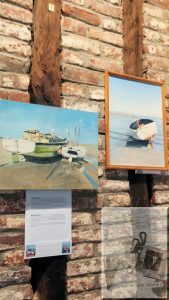 If you are visiting Northern France during this time, you could do worse than spend a few hours visiting Gravelines and its eight pop-up galleries. Dead on the Beach – ~An open verdict was returned at an inquest held this week in Berwick, on the body of Trooper Joseph Gamble, whose home was at Chapel House, Crofton. The deceased disappeared from his unit early in the last month, after visiting the medical officer. The body was found on the beach by a holiday-maker. Deceased was called up in August, 1939, and left England the following year. After serving in Palestine he went through the Syrian campaign, and was with the Eight Army throughout the North African fighting. He was wounded whilst in Tripoli and subsequently he was regraded and sent home to England. The funeral took place at Berwick Cemetery last Monday. Brothers met in India – Mrs Dickinson, 3 Hambleton Street, Wakefield, has received a letter from her husban Corporal Stanley Dickinson, stating that he has met his younger brother, Signalman Jack Dickinson, in India, and spent a short leave together. Corporal Dicki inson, before the war was employed at the Reaicut Wool Co., and he served two and a half years in the N.F.S. at Horbury. His brother was employed on the railway, and is an old scholar of Thornes House School. Wounded in France – Mr and Mrs Sherwood, 23, Esther Avenue, Lupset, have received news that their son, Driver R Sherwood, has been wounded in France, and is now in hospital somewhere in England. Prior to joining the Forces he was employed at Messrs, G Brook and Sons brick-works. He was educated at St Austin’s School. Progressing Favourably – Private R Wormald, K.O.Y.L.I., who was wounded in Normandy on July 27th is reporte to be progressing favourably in a hospital in Birmingham. He is the son of Mr and Mrs L Wormald, 113 Aberford Road, Stanley. He has also served in Norway and Iceland, and before the war he was employed by Sydney Raines Ltd., Wakefeld. His wife is in the W.L.A. Killed in Action – News has been received by Mr and Mrs F Dobson, 2, Saville Street, Emley, that their son Pte., R E Dobson, has been killed in the Burma fighting. He joined the Forces in September. 1939, and went overseas in December of the same year. He was previously employed at Armitage’s, Shelly. Trooper Joseph Gamble – Joseph Herbert Gamble, was the son of George and Sophia Gamble. Joseph served in the KOYLI, as Private 410047. He died aged 30 years on the 24th of August 1944 and rests in Section C A Grave 1349 in Berwick-upon-Tweed Cemetery along 56 other casualties of war. This entry was posted in News on June 9, 2017 by carol. 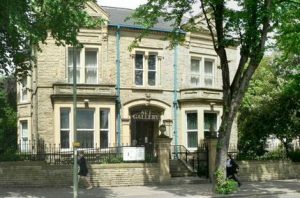 Pictures at Wakefield – Acquisitions of the Art Gallery. Among interesting events at the Wakefield City Art Gallery this year is to be an exhibition of the work of Miss Louisa Fennell, the members of whose family have presented to the gallery nine of the original water colours of Wakefield from which the well-known series of repodictions of views of Wakefield were taken. Miss Fennell faithfully recorded interesting views of Wakefield and the fact that the subjects of the scenes have now altered in most caes almost beyond recognition has made the paintings even more valuable from an historic point of view. With the paintings have also been presented a copy of the artist’s book – “The live of St. Paul in Rome” – and the original sketches for the illustrations. In addition the family have given three fan designs which are water colours on silk, two executed by Miss Emily E Fennell, and the other one by Miss Louisa Fennell. The exhibition of Miss Louisa Fennell’s work is to be held in the Gallery in September. Rece191nt acquisitions by the Gallery are two oil paintings, “Seascape”, by George Chambers, and “Cottage Interior”, by an unknown artist, both presented by Mr A A Haley, and a portrait by a talnted West Riding artist, John A Spancer, purchased by the Corporation from a recent exhibition at the Leeds Art Gallery. Mr T Burgess of Rotherham, has loaned to the Gallery a painting by Pieter Wouverman, a 17th century Dutch artist, and a younger brother of the famous Philip Wouverman, who was born in Aarlem in 1614. The Wakefeld Art Gallery has come prominently to the fore rcently as a result of the special exhibition of pictures suitable for schools, arranged by the West Riding Education Committee, held there. it was th first exhibition of its kind to be held in the North of England. nearly 5,000 people visited the Gallery during the exhibition and inquiries concerning it have been received from all parts of the country, and one from South Africa. Who was Louisa Fennell. Louisa had been born in Wakefield in 1847 to William and Mary Fennell. William worked as a Wine Merchant. 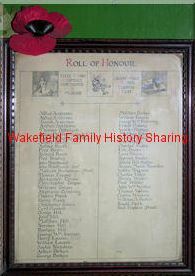 The family of 12, in 1881, lived in Westgate, Wakefield. By 1901, William is an 83 year old widow, still working as a Wine merchant is living with four of his spinster daughters at 31-33 Westgate, with two servants. Ten years later in 1911 Louisa was now the head of the household of 33 Westgate, where she lived with two of her sisters and one servant. Home, 33 Westgate is quite a large house consisting of 12 rooms. Louisa was best known as a painter of landscapes and townscapes in the West Riding of Yorkshire, especially, Wakefield. She also painted a series of townscapes of the City of York. She exhibited widely in the North of England – in 1884 her paintings were exhibited at the Spring Exhibition in Derby. Sometime before 1930 Louisa moved to 21 St John’s Square, Wakefield (according to the 1911 census 21 St John’s Square was a 7 roomed dwelling), and it was there in 1939 that her sister, Bertha, was found living with one servant, Ivy Morgan (later to be Armitage) in 1939. Other residents were, a Company Director, Transport Engineer, Teacher, Headmistress, Inspector of Nurses and Midwives, HM Inspector of Schools. The beautiful three-sided square, with St John’s Church at its centre, is quite unlike the square today. Louisa died on the 13th of March 1930 and rests within the small burial ground surrounding St John’s Church. Probate was registered in London the following month and granted to Emily Esther Fennell and Bertha Fennell spinsters and Charles William Fennell engineers. Effects £1808 10s 6d. 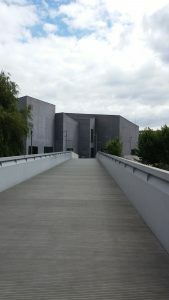 Wakefield City Art Gallery, now having moved to a purpose-built building by the River Calder and re-named The Hepworth Gallery (taking its name from another Wakefield artist) has within its collection 17 Wakefield scenes and other works by Louisa. This entry was posted in News on June 6, 2017 by carol.